New Beginnings Mexico is located on Madre Selva Street in Puerto Vallarta, Mexico. 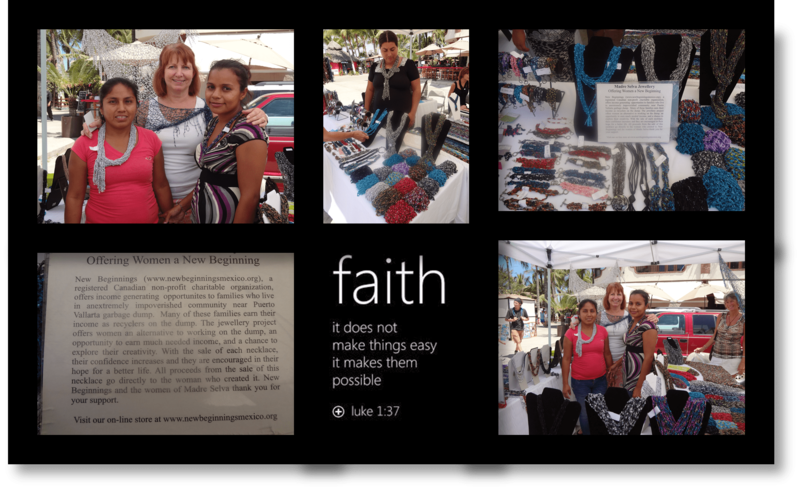 We had the opportunity to speak with Janet at the Old Town Farmers Market in Puerto Vallarta, Mexico about New Beginnings Mexico and their mission. We learned a lot about their vision and the incredible work that has been accomplished by her family and their team of volunteers. The mission of New Beginnings Mexico is to assist the families of Puerto Vallarta who reside in crudely-build structures near the old city dump. This dump site is now closed and no longer operational, which left the families who had depended upon sifting through the garbage to collect recyclable materials and sell them to earn a living in a severe emergency situation. Husband-and-wife missionary team Andy and Janet, along with their daughter Brittany and other volunteers, have stepped in to help these impoverished families become self sufficient and no longer dependent upon the dump as their primary source of income. Backed by their Christian church volunteers from Canada (this charity is a Canadian non-profit organization) and both local volunteers and foreign volunteers who arrive to help, this organization has accomplished some truly amazing things. This charity organization is a fantastic choice for churches and youth groups who are looking for that special mission-trip opportunity. 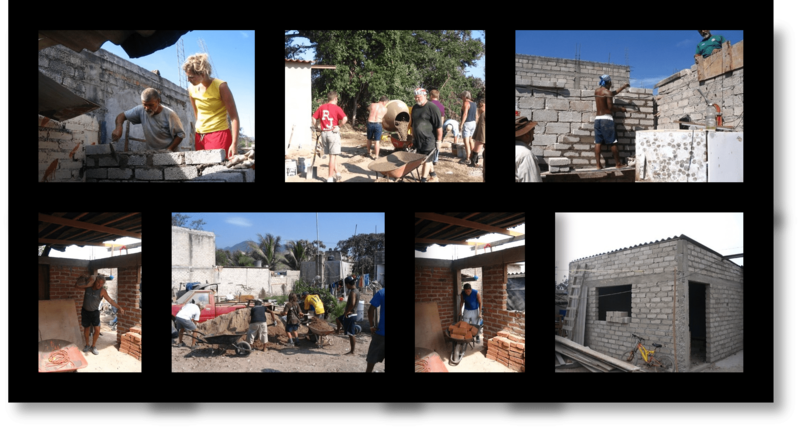 Each organized group of mission volunteers must pay their own airfare, lodging and meals, and bring donations to fund their charity work and/or contribute to new or ongoing projects such as building construction, materials and tools for teaching new skills, their food program for families, etc. New Beginnings Mexico is also focused on teaching the families new skills to earn a living. Men are being instructed in how to build furniture and create crafts to sell. Women are learning new skills for creating unique beaded jewelry and accessories to sell to the general public. For mission trips, please visit their website for their volunteer application form that must be submitted for each member of your volunteer group. The Artisans of Madre Selva in Puerto Vallarta, Mexico. During the high-season months they operate a booth at the Old Town Farmers Market that’s set up on Saturdays from 9 a.m. to 1 p.m. at Lazaro Cardenas Park in the Romantic Zone area of Puerto Vallarta. With the exception of the bible verse, the above photos were taken at the Old Town Farmers Market at Lazaro Cardenas Park in Puerto Vallarta, Mexico. This is one of the locations where the Artisans of Madre Selva sell their beautiful hand-crafted jewelry and accessories. New Beginnings Mexico offers income-generating opportunities to families who live in an extremely impoverished community near the Puerto Vallarta garbage dump. Many of these families earn their income as recyclers of materials found at the dump. The jewelry project offers women an alternative to working at the dump (so they don’t have to travel each day to the new dump location and work in an extreme environment), an opportunity to earn much-needed income, and a chance to explore their creativity. With the sale of each necklace, their confidence increases and they are encouraged in their hope for a better life. All proceeds from the sale of these necklaces go directly to the woman who created it. New Beginnings and the women of Madre Selva thank you for your support. New Beginnings is a registered not-for-profit Canadian Charitable foundation. Visit their online store at www.newbeginningsmexico.org.